It will be noted that 3257 was at the trailing end of the train which collided with the stops at harrow only to be written off on the cross over at Piccadilly two years later! To make up a good unit after 3257 was scrapped(cut up in Stonebridge Pk lifting shop)3357 was turned & put on the north end & an UNDM put in the middle motor position.The unit is now numbered 3299. Now that they have to see out another decade or so, and with spare 1967ts, is there any chance that the unit will be standardised with a replacement DM? 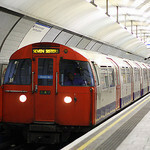 There has been murmurings of adding two additional trains to the Bakerloo fleet so no doubt unit 3299 would be standardised. A spare UNDM will need to be refurbished however. The interior fittings may come from a 67 car. A special 45XX trailer will also need to be made up. None survived as part of the 67 fleet as these were all 4 car units. I bet they will need a lot of work to convert them? For the brief time I was working on overhauling brakes for both 72 and 73, it was explained to me how both stocks used the same brakes (I may be mistaken however). Just to clear this up for the record, the brake control system on 73TS is quite different from the 72TS but the brake cylinders should be very similar (I haven't seen either for about 30 years). What is different about them is the way the air gets into them. On the 72s, the system is similar to the C Stock rheostatic and Westinghouse electro-pneumatic system with a brake pipe (called the Train Line like American terminology) for backup and emergency braking. The 73s use rheostatic braking and the Westcode system with a 7-step relay valve and electrical control of emergency braking. There is no Train Line. The two system are incompatible. How many units of 67 Stock remain and are suitable to augment the 72 Stock fleet? The Bakerloo has had enough had me downs! I love the '72 stock more than the '73 stock! It make sense to wait till Crossrail is running before upgrading the Piccadilly line so as not to affect the Heathrow service much. Though I wouldn't mind using '72 stock in 2040 lol! Quite agree. I'd love to be using the 72 stock for the next 20 years! My favourite trains still in service by far. Well I guess we'll have to ensure that new bakerloo line trains can handle curves well! Given the age of these trains maybe Queens Park Bakerloo Line station platforms should be renamed Jurassic Park!